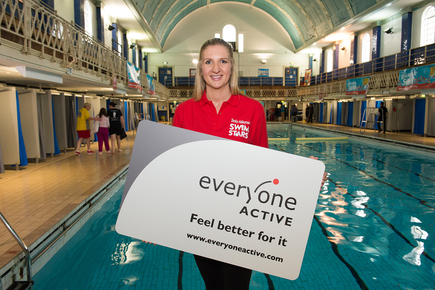 Becky Adlington’s SwimStars works in partnership with leading leisure operator Everyone Active in a joint pledge to ensure every child leaves primary school able to swim at least 25 metres. Through our own School Swimming programme, and the Everyone Active Swimming Scheme we endorse, we can do something about the concerning national statistics that show a third of children still leaving primary school unable to swim this National Curriculum requirement. In 2016, Becky and Everyone Active celebrated the 125th anniversary of school swimming, with a Victorian themed and Olympian led event at Westminster Lodge Leisure Centre alongside Parliamentary Under Secretary for Sport, Tracey Crouch MP. Whilst progress has been made since the dry-side swimming lessons of Victorian times, there is still lots to be done to get our children safe in water, and this partnership is making an impact on a daily basis to over 50,000 young people through school swimming programmes. In order to help get young people swimming however, it is essential for parents and guardians to feel comfortable and able to take them, and this formed the basis of an exclusive research project between Everyone Active and Becky Adlington’s SwimStars aimed at understanding the barriers to taking children swimming. Both organisations are now working hard to remove and reduce these barriers, so stay tuned for announcements on this! The research findings can be found by clicking here. More recently, our Director and Olympian Steve Parry chaired the Government-commissioned School Swim Group, alongside Jacqui Tilman of Everyone Active, and the recommendations for improvements in school swimming can be found by clicking here. We are proud to partner with Everyone Active and support their School Swimming Scheme in 96 pools nationwide!